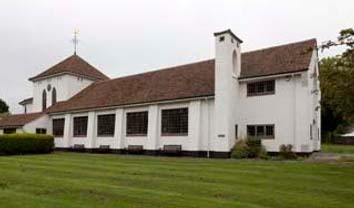 A mission church for Hampden Park, which was in the parish of Willingdon, opened in 1908 (BN 95 p747) and was designed by W H Murray (church website). It was a low brick building with square domestic-style windows that broke the line of the eaves of the roof. This church was destroyed by bombing in 1940 (Brown) and replaced by a new church in 1952-54, designed by Sir E Maufe (ET 11 (Sept 1996) p16). Built of white-painted brick, it has the unusual feature for Maufe of a tower in an axial position. It stands on plain pointed arches and there are similar transverse arches in the chancel and sanctuary, with concrete vaulting between. The external detail of the chancel is also highly simplified gothic, but the nave is more domestic in appearance, with long and low proportions and timber-framed windows, separated by shallow buttresses; near its western end to one side is a belfry. The fittings, many in limed oak, were designed by Maufe or executed under his supervision. Glass: (East window) M Forsyth, 1953 (DSGW 1958).